In previous articles we looked at evangelism from a Biblical (part 1) and historical (part 2) perspective. 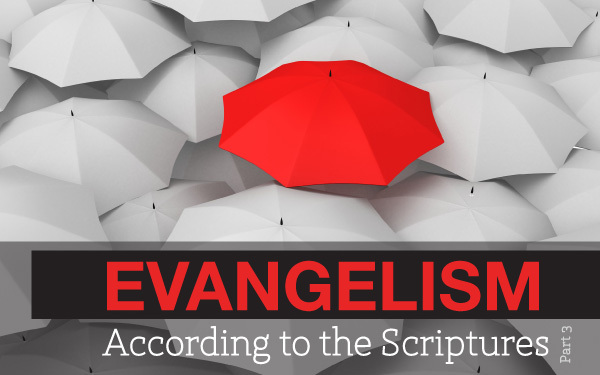 In the present article I would like to offer some suggestions for the practice of evangelism. We need to start with something that may seem obvious but is easily forgotten: a congregation can be ‘successful’ in evangelism only if it really believes what it professes to believe. If we do not seriously believe that unbelievers are under the wrath of God and that we ourselves have been saved from eternal judgment by the death of Christ, we will not be greatly motivated to proclaim the gospel of salvation to others. Related to this, a congregation can hardly be successful in evangelism if it is not a living congregation. A church that has forsaken its first love like the church in Ephesus (Rev. 2:4) or a church that has become lukewarm like the church in Laodicea (Rev. 3:16) will struggle to attract outsiders. However, if believers are strong in their faith the congregation may “win the respect of outsiders” (1 Thess. 4:12) and some of those outsiders may realize their position before the face of God and seek salvation. Similar things could be said about the reputation which a congregation has in the broader community. If church members are known to be honest and reliable people who live respectable lives, this will serve to support evangelistic efforts. But if some members of the church are known to be corrupt businessmen or womanizers or drunkards, that will seriously undermine any evangelistic projects (unless it is known that discipline is exercised in such cases). In short: It is hard for an unbeliever to find new life in a church that is spiritually dead. In order for people to come to faith and be born again, it is important that they have opportunities to be among Christians who are strong in faith and live their lives with integrity. This is the main factor which determines whether a church is ‘successful’ in evangelism or not. If a church fails to draw others to church, the problem is usually not that there are no resources or man-power, but rather that the first love has grown weak. In addition to this, it is important that the whole congregation (not just a few individuals) should share the desire that unbelievers might be saved and join the congregation. Such a desire will only be found among believers who understand the principle of sola gratia, who realize that they have been saved only by the grace of God. Everyone in the congregation should desire that God would receive glory and honour by means of the addition of more people to the number of those who are saved. The best method of spreading the gospel is using personal contacts. The more we live in this faith, the easier it will be to use opportunities and speak to unbelievers. The best method of spreading the gospel is using personal contacts. Research has shown that for about 70 % of converts to Christianity the most important factor in the process of their coming to faith was a relationship with a Christian friend, relative, colleague or neighbour. Ideally, members of the congregation would use their contacts in the broader society to talk about the gospel and invite people to come along to church. The congregation should then be ready and prepared to receive such people warmly. There should be programs in place for instructing newcomers to the faith. It is important, however, that such programs do not occupy an isolated place somewhere at the fringes of church life, but are carried by the support and the prayers of the whole congregation. In the third place it is important that the church’s activities be characterized by a missionary flavour. If our missionary endeavour is restricted to an annual Vacation Bible School (VBS) we should not be surprised if we struggle to attract unchurched people. A VBS can be a wonderful evangelistic tool but if it is an isolated activity which is not integrated in congregational life its effectiveness is seriously hampered. What is needed is a missionary flavour to characterize regular church activities. What is needed is a missionary flavour to characterize regular church activities. Take for example the worship service. While the minister addresses his sermon to the congregation of the Lord in the first place, he should be mindful that there are visitors in church. This will give his sermon a missionary flavour. The same applies to congregational activities such as Bible study meetings. It can be a challenge for a Bible study group if there are a few guests present who want to know more about the gospel. Of course, you don’t want to bring in enemies of the gospel. But if you have a friend or colleague who wants to know more about the gospel, why not take him along to the regular Bible study? You may find that the presence of such a guest adds a new and exciting dimension to the Bible study meeting. During my time as a missionary in South Africa I often taught mixed groups of Catechism students. I would encourage the young people of the mission congregation to take friends along to Catechism class. The only condition was that these friends had to be willing to function in a positive way and do the homework, including memorizing parts of the Catechism. I can testify that the Lord blessed this approach and that over the years many young people came to faith through this avenue. How this is put into practice may vary from place to place. The size of the congregation and the workload of the minister will play a role in this. Generally speaking it would be good if consistories expected their ministers to devote part of their time to evangelistic activity. A consistory could tell the minister, for example, that out of every ten home visits he should do two or three visits with unbelievers and report about them at consistory meetings. The minister should also generally be the one who teaches the new members’ group. As we have argued in the previous article, the minister and the elders should visibly support evangelistic activities. In this way, the congregation will understand that evangelism is an important ministry. So far, I have discussed evangelism from the perspective of a local congregation. But sometimes there is no local congregation where new believers can join. It is important, therefore, that we should also consider church planting. The Canadian Reformed Churches have been blessed by continuous growth over the past fifty years. On average one new church has been instituted per year. This is great and we recognize the Lord’s blessing in this. At the same time, we know that most of the growth came from within. When a congregation outgrew the church building, the congregation would split in two and a new congregation would be formed at some distance (usually not too far away). While there is nothing wrong with this form of growth, I suggest that the Canadian Reformed Churches could adopt a bolder approach and consider sending missionaries or evangelists to plant churches in new areas. Why not plant churches in places such as Saskatoon, Regina and Kitchener-Waterloo? Fast-growing urban areas are usually good places to start a new church. Other target groups which could be considered are immigrant communities (Muslims, Hindus). In the previous article I mentioned that the Secession churches in the Netherlands (19th century) discussed evangelism at all levels of church life including the major assemblies. We can learn from this. It would be wonderful if evangelism was a regular item on the agenda of classis meetings. Let me end with a very practical suggestion: There are eight classis in the federation of the Canadian Reformed Churches. It should be possible for every classis to initiate and support at least one new church plant in Canada. If every classis did this, we would have 8 church plants on the go within a few years. Is this impossible? I don’t think so. We have the structures and the finances. We will probably have men who can be sent out to do this. We do, however, need the vision and desire to initiate this. God so loved the world that He gave his one and only Son, that whoever believes in him shall not perish but have eternal life (John 3:16). May we so love our God and so love our neighbour that we use our opportunities and resources to spread the gospel of salvation here in North America. And may we be bold and creative in finding effective ways to do this. These three articles appeared respectively in Clarion: the Canadian Reformed Magazine, January 2, 16, and 30, 2009.